Panicled Erycibe is a large woody climber with young branches, leaves and inflorescence densely rusty velvety. Leaves are 4-8 x 2-5 cm, broadly elliptic or elliptic-obovate, base rounded, tip broadly tapering, leathery, lateral veins 5-6 pairs, stalk up to 1 cm long. Flowers are borne in panicled cymes in leaf axils and at branch ends. 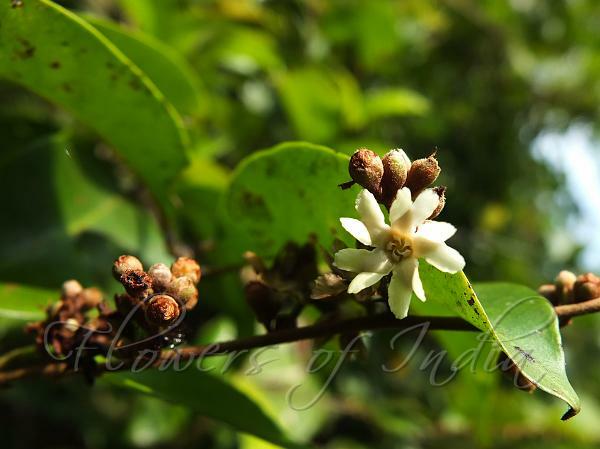 Flowers are 6-8 mm across, fragrant, creamy-white. Calyx tube 1.5-2 mm long, sepals 5, ovate, obtuse, densely-brown velvety. Flowers are bell-shaped, flat-faced, tube 1-1.5 mm long, hairy outside, petals 5, 2.5-3 mm long, each deeply divided and seemingly 10. Stamens are 10, protruding. Ovary 1-celled, ovules 4; style absent; stigma spherical. Berry is 6-8 x 3-3.5 mm, ovoid or ellipsoid, seed 1. 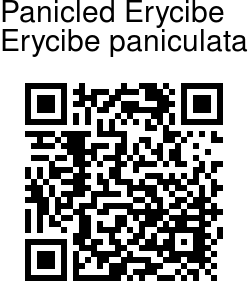 Panicled Erycibe is found in India, Himalayas, Andaman Islands. Flowering: November-March.